Terrain Vallonne is French and roughly translated means the undulating land. Mollie lives in the Gers, a small land-locked department, in South West France at the foot of the Pyrenees. What she loves about this region are the changes in season, the shifting variations in the colour of the land, the rolling hills and ancient woodland as well as the hedgerows full of wild plants and flowers. The medium of clay provides the perfect material in which to express her thoughts and ideas about the wonder of the wildness around us. Every piece is hand built using a variety of techniques but slab building is core. Mollie impress rolled clay with plants, found objects and blocks that she has carved by hand, cut and then assembled. Colours are applied in many layers using engobes, liquid wax as resist and oxides to enhance textures and plant forms. 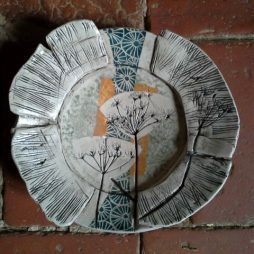 All her work is made from grogged stoneware and fired to 1260°c. In the summer of 2015 Mollie started to explore her ideas through the technique of block printing on fabric. 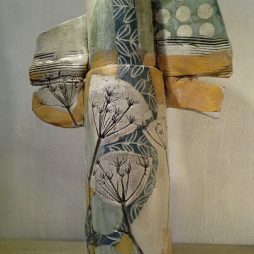 She has been working with clay since she graduated in 1997 and has exhibited widely throughout Europe.